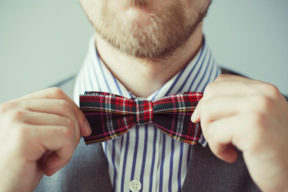 A bow tie’s color can actually say many things about your personality. 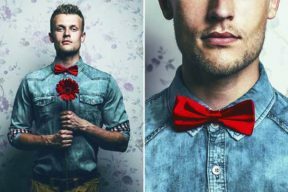 If you wear red bow tie, you want to show off your power, authority as well as passion to other people. If you wear black bow tie, it means that you want to just go for the basics. And in case you want to wear blue bow tie, it means that you are elegant and mature as well as trendy and stylish at the same time. A blue bow tie is also having a neutral feeling that can blend well with a lot of other colors. 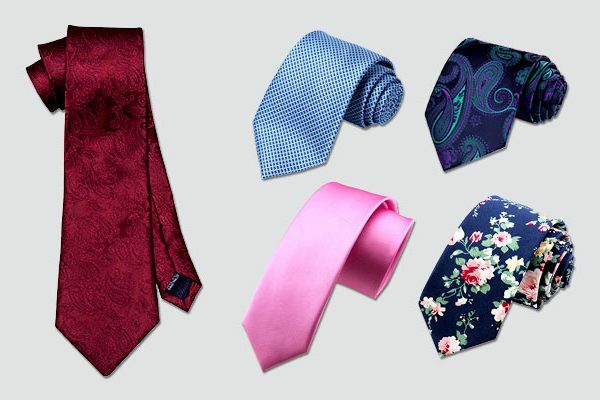 Since blue is the favorite color of many men, you will find out that there are a lot of great, not to say best blue blow ties for men on the market. 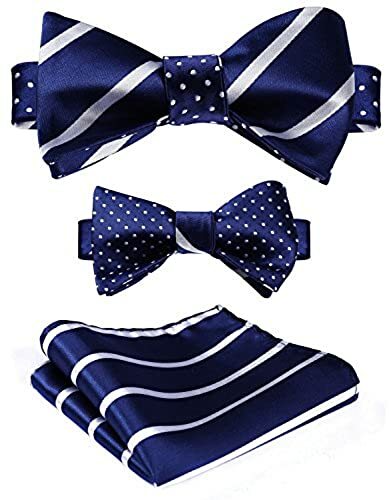 There are many differences between them such as the shades of colors, materials and sizes that you all need to take into consideration when choosing a blue bow tie. This men’s pre-tied royal blue bow tie is made from 100 % of polyester silk. This bow tie is 12 inches in length and 5.5 inches in width. It comes in a set with a pocket square. The pocket square’s dimensions are 21.5x 21.5 inches. There is one size that fits all with an adjustable band collar. The strap can fit up to a 19.29-inch neck. 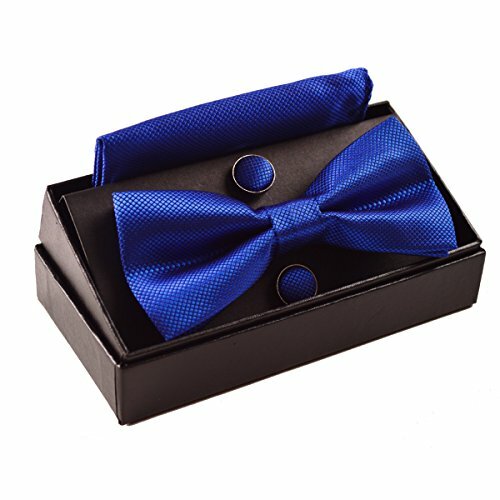 The package contains 1 bow tie, 1 pocket and 1 pair of cufflinks inside a high quality gift box to make a perfect gift. Not only does this bow tie is the best blue tie for men but these other accessories are also of high quality. Verdict: This could be a great gift for an adult male to wear to any wedding and formal parties. It will look great on a royal blue suit. There are 2 shades of blue for you to choose from- which are light blue are and navy blue. There is one size that fits all with an adjustable strap. The strap can fit up to a 20-inch neck. The light blue bow tie has bright colors which are a little bit darker than show on the picture. 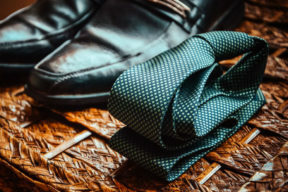 Verdict: It is one of the best bow ties for men that can be worn for both casual and formal events so if you are looking for a versatile bow, you can consider it. The light blue bow tie looks great for more casual events such as weddings while the dark navy one is more suitable for formal events. It is available in 2 kinds of blue which are dark blue and light blue. There is one size that fits all with an adjustable strap. The strap can fit up to a 20-inch neck. There is a 0.5-inch gap between the claps and the tie, which is very noticeable. This man’s pre-tied dark navy bow tie from 100 % of woven microfiber which produced by Dan Smith Company. This bow tie is 12 inches in length and 6 inches in width. There is one size that fits all with an adjustable band collar. 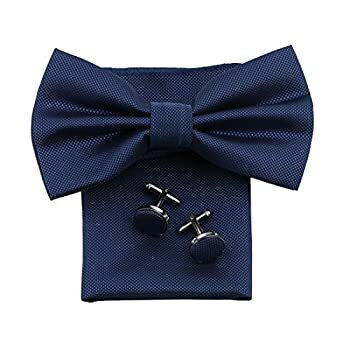 The package comes with a bow tie, a handkerchief and a pair of cufflinks. 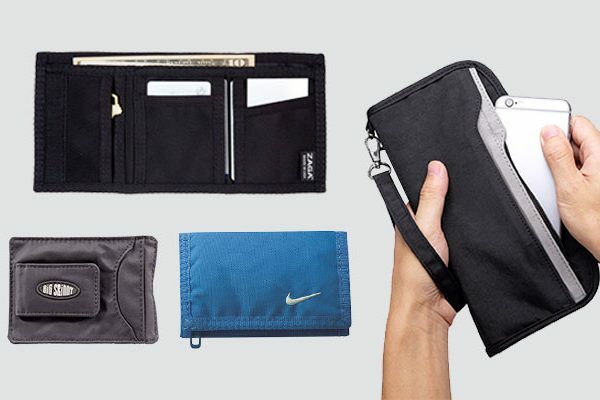 This product’s range has so many colors of blue for you to choose from such as navy, dark blue, indigo and dark slate blue. These two latter colors are hard to come by on the market now. 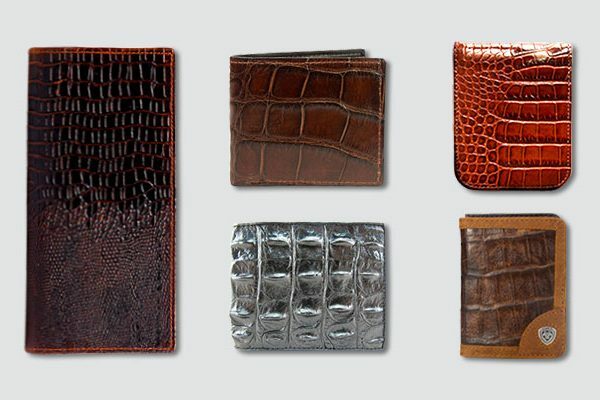 All of the items in the package are made with excellent craftsmanship for solid stitching lines and no loose threads. 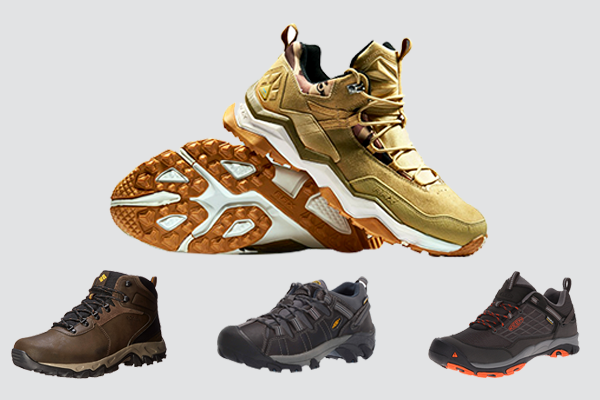 The woven material is also soft and smooth. The tie runs a little bit large, which might not be suitable for older boys. 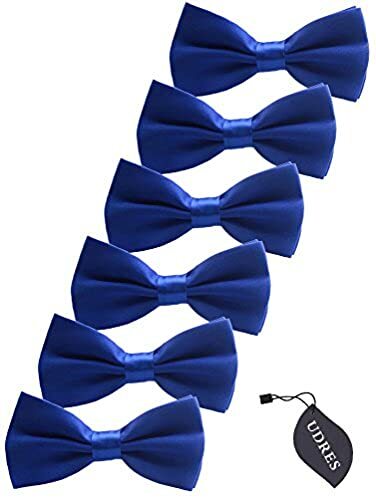 It is relatively more expensive than other blue bow ties you can find on the market. Verdict: It is suitable as a gift you can bring to someone. In addition, you can wear this bow tie with your dark solid color suit or dark navy suits. It is available in various blue colors with different colors in the pattern. 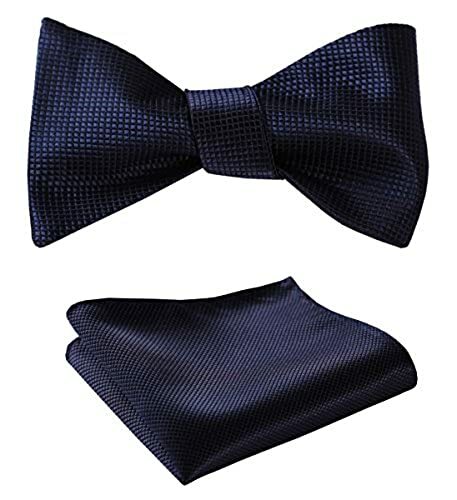 For example, you can go for a navy blue bow tie with white polka dots or light blue bow tie with pink stripes. There is one size that fits all with an adjustable strap. The strap can fit from 12.60 inches to 16.93 inches of neck. The bow tie comes with a set with a handkerchief. The handkerchief size is 10 x 10 inches. Caring for this self-bow tie is quite difficult as you can only wash it by hand only. 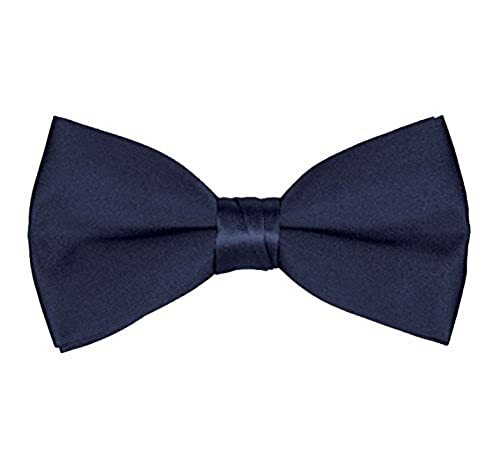 This men’s pre-tied dark blue bow tie is made from 100 % of silk. The length of the bow is 4.33 inches and the width of the bow is 2.68 inches. It features solid color with no pattern on the bow tie. This blue bow tie is available in one size that fits all with an adjustable strap. The strap can fit from 12.60 inches to 16.93 inches of neck. A handkerchief is also included in the set. The size of this handkerchief is 10 x 10 inches. The bow tie, along with the pocket square, is wrapped inside a high quality box to make it a perfect gift. The material of this self-bow tie is of very high quality that brings an elegant and classy look to the wearer. The color looks expensive and elegant which promises to stay the same even after you have been wearing it for quite a while. You cannot wash the tie in the washing machine as it will shrink quickly. Verdict: If you like to have a fancy tie with unique pattern like no other tie on the market, this one is for you. 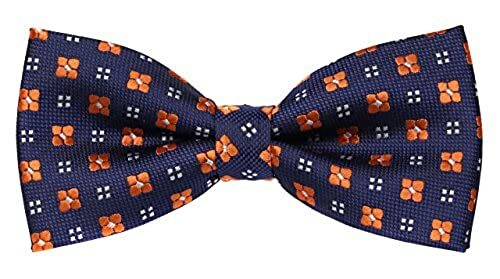 This is one of the best bow ties for men to wear to a prom or party. This men’s pre-tied light blue bow tie is made from 100 % of polyester silk. This bow tie is 12 inches in length and 5.5 inches in width. It comes in a set with a pocket square. The pocket square’s dimensions are 21.5x 21.5 inches. The size of the strap is a little bit smaller than other bow ties on the market at the moment. Verdict: This could be a great gift for an adult male to wear to any wedding and formal parties. It will look great on a royal blue suit for a formal or a business event. This blue bow tie is made of 100 % of pure silk. There is one size that fits all with an adjustable strap. The strap can fit up to a 20-inch neck. The set includes self-bow tie and a handkerchief. The bow tie is 2.5 inches in width and 37 inches in length. The handkerchief size is 10 x 10 inches. This self-bow tie is very easy to tie in a short amount of time. This bow tie is reversible. You have 2 options of patterns in 1 tie- which are polka dots and stripes. The fabric is very silky and smooth with a nice, unisex design. It is well made with no loose threads and the stitching lines seem to last for a long time. After wearing the bow tie, it could start fraying. Verdict: If you want to buy a stripe and polka dot bow tie, you can consider this option. This bowtie is made of 100 % of silk with the width of 4.72 inches. It comes with the color blue and orange floral pattern. There is one size that fits all with an adjustable strap. The strap can fit from 9 inches to 18 inches of neck’s size, mostly of adults and older boys. This man’s pre-tied dark navy bow tie from 100 % of polyester microfiber. This bow tie is 12 inches in length and 5 inches in width. There are 2 options of blue color for you to choose from. 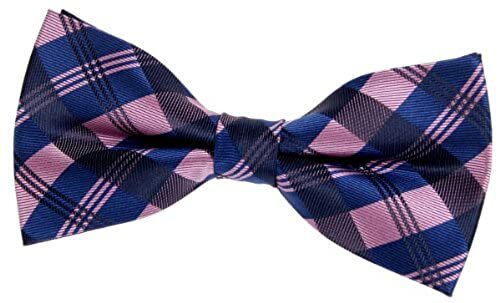 You can consider having a pink bow tie with navy checks or dark blue bow tie with light blue checks. There is one size that fits all with an adjustable band collar. The strap can fit up to a 19-inch neck. The pattern is quite bold and stylish but at the same time has a hint of classy, vintage look. The color is very vibrant and durable. Not to mention that the material is very soft and smooth with a premium quality. The price of this product is very affordable. 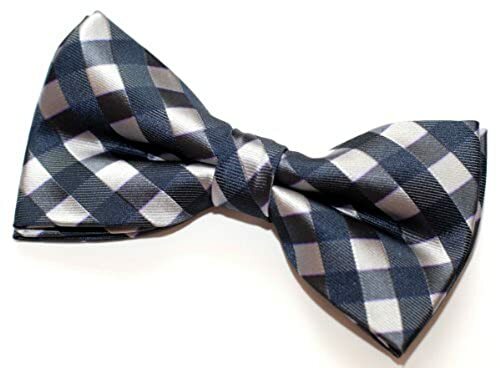 With this type of bow tie, you should only dry clean it. The tie’s width is a little bit smaller than other blue bow ties. Verdict: In case you are seeking for a stylish, vintage blue bow tie to wear for both formal and casual events, this one is worth considering. It is also suitable if you want to wear a bow tie with your unisex outfit. It is available in navy blue with grey check. There is one size that fits all with an adjustable strap. The strap can fit up to a 19-inch neck. 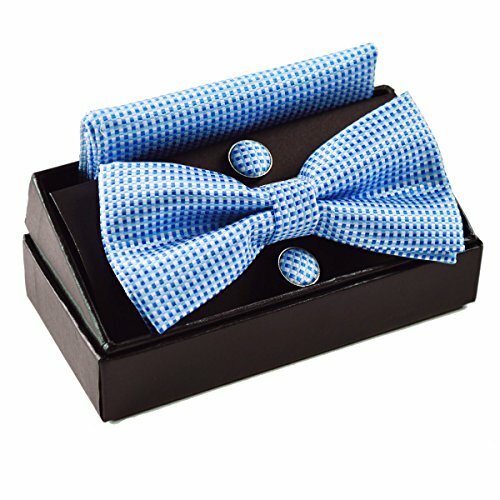 This blue bow tie comes in a nice tight zip-lock packaging to make a perfect gift. The stitching is very nice with great craftsmanship. In addition, the material feels really smooth and gives a silky elegant look to the bow tie. This blue bow tie is for dry clean only. This blue color looks quite grey and purplish, especially near the pink areas. 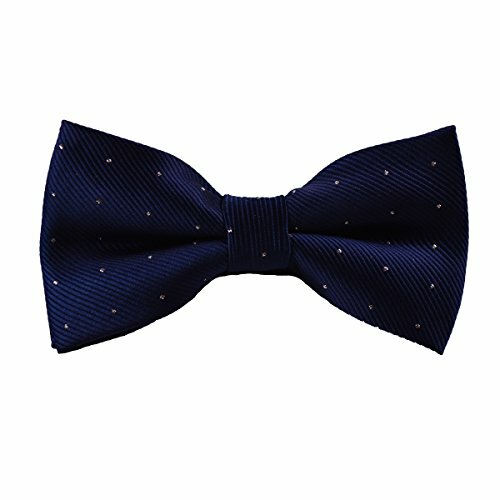 Verdict: If you are looking for checked woven microfiber pre-tied blue bow with unique and vintage design, you can consider this product. This is also suitable to wear at a semi-formal event. This man’s pre-tied dark navy bow tie from 100 % of polyester silk. This bow tie is 12 inches in length and 6 inches in width. There is one size that fits all with an adjustable band collar. The strap can fit up to a 19.29-inch neck. 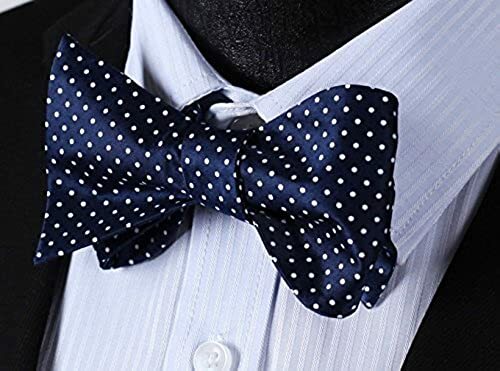 Besides the option of dark navy with silver dots, you can also have the options of light bur bow tie with white dots and royal blue with white dots. The color looks really nice. Along with the high quality material, it is expected for the color to remain the same shade for a long amount of time. The strap is very secure which helps the bow tie to remain on the same place for a long time. Finally, the material of this bow tie feels very smooth and soft on your hand- it gives you a very expensive feel. This pre-tied bow tie might run a little bit smaller than other blue bow ties on the market. Verdict: This blue bow tie is suitable for any wedding and occasion party. It will go well with your polka dotted or plain blue shirt. As you can see, there are a lot of blue bow ties on the market. 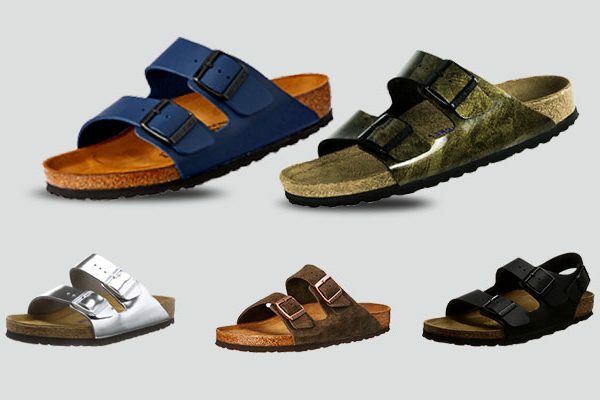 They come from many shades such as navy, light, dark and royal blue. The materials are also varied a great deal as well- some are made from silk while some are made from high quality polyester material. 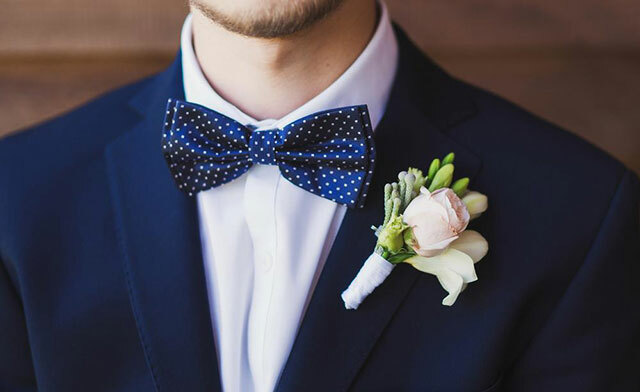 No matter what your preferences and requirements are, I hope that after reading this article, you would be able to find the best blue bow ties for men to add to your bow tie collection. Trust me, you will use it so often and enhance your style a great deal thanks to this small accessory.